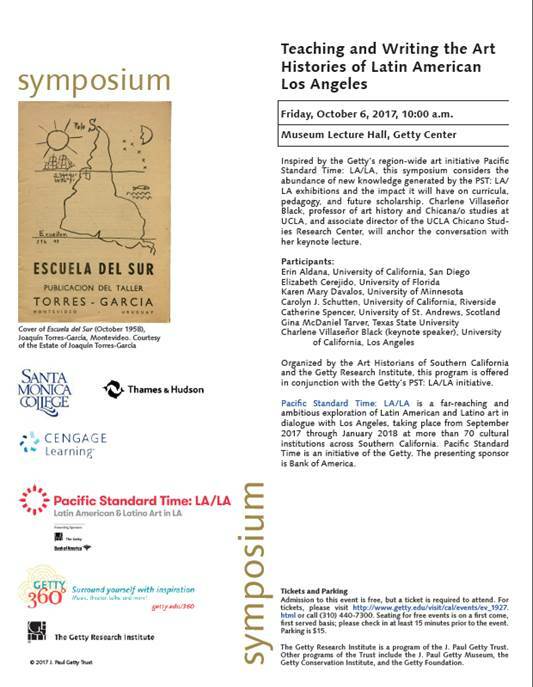 The Art Historians of Southern California & The Getty Research Institute present: Teaching and Writing the Art Histories of Latin American Los Angeles. 10.6.17 at the Getty Center. Keynote address by Dr. Charlene Villaseñor Black, Professor of Art History and Chicana/o Studies at UCLA, and Associate Director of the Chicano Studies Research Center. 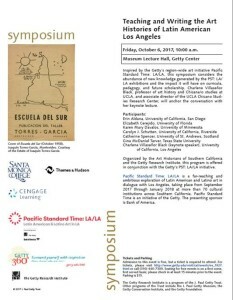 Inspired by the Getty’s region-wide art initiative Pacific Standard Time: LA/LA, this symposium considers the abundance of new knowledge generated by the PST LA/LA exhibitions, and how it will impact curricula, pedagogy, and future scholarship. Charlene Villaseñor Black, Professor of Art History and Chicana/o Studies at UCLA, and Associate Director of the Chicano Studies Research Center, will anchor the conversation with her keynote lecture. What are the states of Latinx and Latin American art history? How can decolonial methodologies encourage politically engaged scholarship and a radical new future for the study of Latinx and Latin American art? Using the exhibition “Xerografia: Copyart in Brazil, 1970-1990″ as a case study, this paper analyzes the role of local art histories within a larger context, as well as the question of how to find common points across the art histories of vastly different countries. My presentation will aim to re-orient the political activism in Felix Gonzalez Torres’ work, as well as his personal bicultural identity within a broader art historical legacy of iconoclastic Latino art groups and movements such as the Chicano collective, ASCO. Drawing on newspaper articles, old photographs, work rosters, and cement factory archives, this presentation interrogates the terms “Spanish” and “Mexican,” examines notions of racialized building materials, and explores the social history of ethnic Mexicans who constructed Mission Revival and SCR architecture. Taking as its starting point the 1971 exhibition Arte de Sistemas (Systems Art), organized by the Centro de Arte y Comunicación (Cayc) in Buenos Aires at the Museo de Arte Moderno, this paper explores the networked model of artistic interrelation elaborated by this project and its curator Jorge Glusberg, through which conceptual and performance practitioners based in Los Angeles and Southern California were linked to a range of artists working in Latin America and Europe. This paper places the work of Colombian artist Alicia Barney—a pioneer of ecological art in Latin America—within a broader framework of “ecofeminism” by comparing her environmentally-focused work of the late 1970s and early 1980s to that of women working during the approximately the same period in California, such as Betty Beaumont and Jo Hanson.